Video #1 – The ball is launched at a 42 degree angle, and hits the ground 96 meters away from the launcher. Video #2 – The ball is launched at a 36 degree angle, and hits the ground 133 meters away from the launcher. Both videos were shot at 240 frames per second. At what speed were the balls launched? 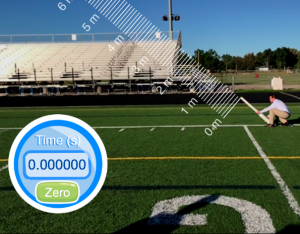 Do these speeds and angles match your predictions based on kinematics? Why or why not?